Going, going, and almost GONE! LAST-CHANCE PRODUCTS!! LAST-CHANCE PRODUCTS! Get them before they are GONE!! That’s right! This is the LAST CHANCE to get some of YOUR favorite items that will be retiring soon and the last chance to get some of the items on YOUR wish list. Items on the retired list are “while supplies last,” and some of YOUR favorites could sell out quickly! You’ll want to place their your as soon as you can to ensure you will be able to get all the items you want. One of my favorite retiring Suites is Birthday Memories. Here are a few of the cards I’ve made with this colorfully cute Suite. Stamps, Dies and very colorful Birthday Memories Designer Series Paper are ALL retiring, so get your supplies NOW to make these and many other totally adorable birthday cards for kids of all ages! For the link to the Retiring List for the Annual Catalog click here. For the link to the Retiring List for the Occasions Catalog click here. Shop for these and all things Stampin’ Up on my website at http://www.craftingonthehill.stampinup.net. Detailed Dragonflies Card and a Last Chance Sale! Marvelous March just flew by for me. I got to spend time with all of my kids and grands and it was just wonderful for this Nana! The Dragonfly Dreams Stamps Set and coordinating Detailed Dragonflies Dies really make beautiful projects! This is one of the cards we made at a recent Crafting on the Hill Team Meeting. Fast and fabulous! This is a detail of the dragonfly. The background is the dots from the Dragonfly Dreams Stamp Set inked and stamped off in Sweet Sugarplum. The base of the Dragonfly is stamped in Memento Ink. The second of the two step Dragonfly is stamped in Fresh Fig. The wings are also stamped in Berry Burst. The Dragonfly was then cut out with the Big Shot using the coordinated Detailed Dragonflies Thinlits Dies Set. Wink of Stella was used to add a little “bling” to the wings and the eyes and a rhinestone added the final touch. One of my favorite things about using Stampin’ Up products is that everything is coordinated for you! 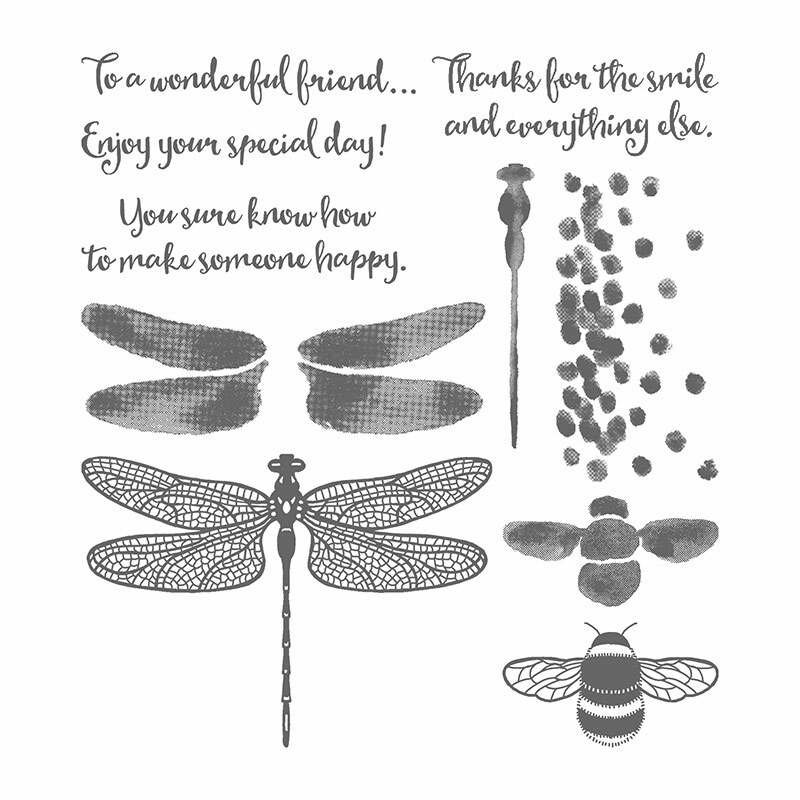 Look at all the lovely sentiments in this Dragonfly Dreams Stamp Set. 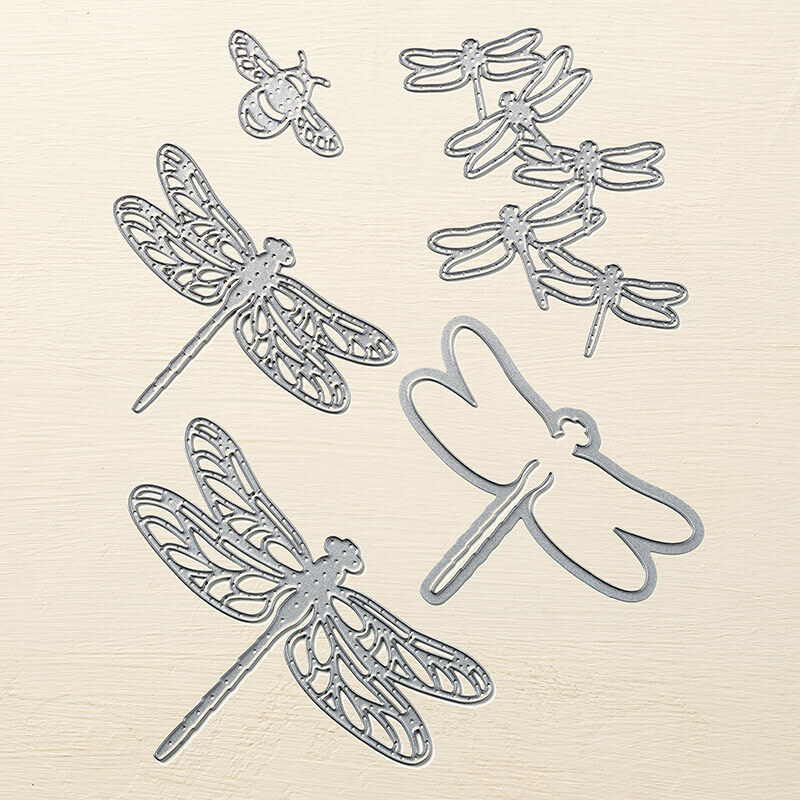 The coordinated Detailed Dragonflies Thinlits Dies Set makes creating this beautiful dragonfly so easy! TWO FABULOUS SALES GOING ON NOW!! LAST CHANCE TO GET RETIRING PRODUCTS!! Some of your favorite items will be retiring soon and this is your last chance to get some of the items on your wish list! Items on the retired list are “while supplies last,” and some of your favorites could sell out quickly! Be sure to place your order as soon as you can to ensure that you will be able to get all the items they want! Go to http://www.craftingonthehill.stampinup.net for the COMPLETE list and to shop today before your favorites are gone! Want papercrafting without the hassle? Stampin’ Up! has a fun, easy solution, and it’s called Paper Pumpkin—a fantastic, monthly subscription service which delivers pre-designed, precut papercrafting projects straight to your doorstep. And right now is the perfect time to subscribe. When you join Paper Pumpkin in April or May, you’ll get 50% off your first 2 months!! Just go here to subscribe! Cost for those who have not yet subscribed is $5 to attend and create a Make & Take of your choice. $2.00 for each additional Make & Take. Subscribe to Paper Pumpkin at the Event and the Event is FREE! Get your first two months of Paper Pumpkin for 50% OFF!!! RSVP by Tuesday, April 24th. 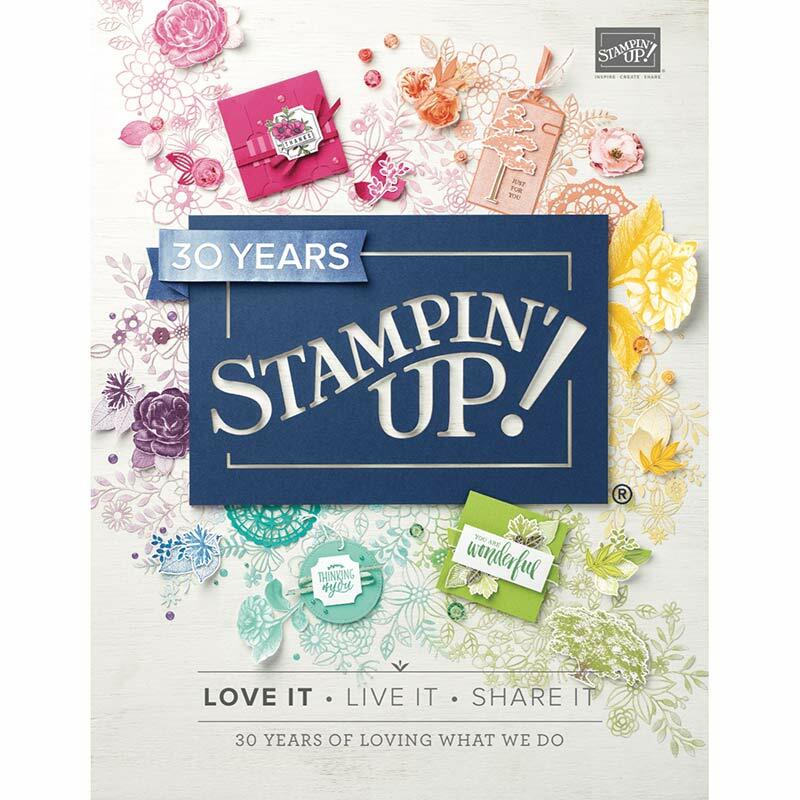 Stampin’ Up Starter Kit Ultimate Bundle.